Over the past decade, many efforts have been made to identify MHC class II-restricted epitopes from different tumor-associated Ags. 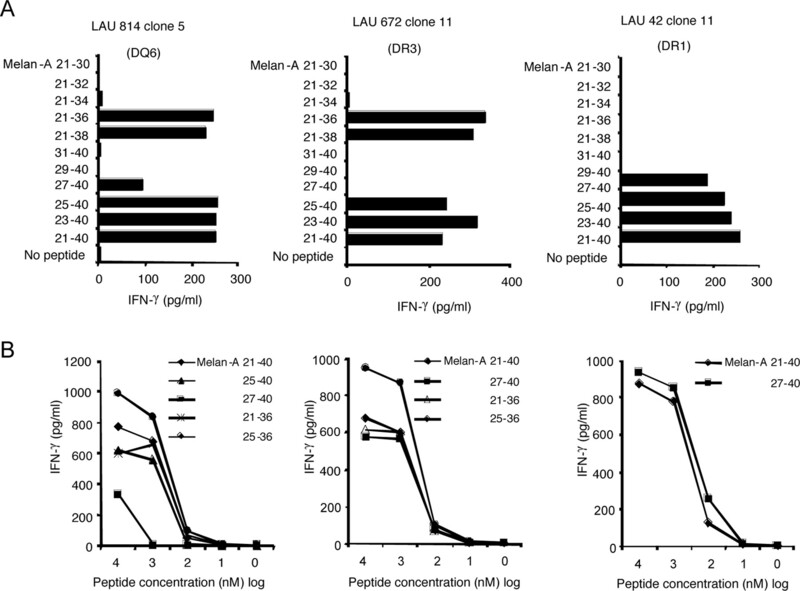 Melan-A/MART-126–35 parental or Melan-A/MART-126–35(A27L) analog epitopes have been widely used in melanoma immunotherapy to induce and boost CTL responses, but only one Th epitope is currently known (Melan-A51–73, DRB1*0401 restricted). In this study, we describe two novel Melan-A/MART-1-derived sequences recognized by CD4 T cells from melanoma patients. These epitopes can be mimicked by peptides Melan-A27–40 presented by HLA-DRB1*0101 and HLA-DRB1*0102 and Melan-A25–36 presented by HLA-DQB1*0602 and HLA-DRB1*0301. CD4 T cell clones specific for these epitopes recognize Melan-A/MART-1+ tumor cells and Melan-A/MART-1-transduced EBV-B cells and recognition is reduced by inhibitors of the MHC class II presentation pathway. This suggests that the epitopes are naturally processed and presented by EBV-B cells and melanoma cells. Moreover, Melan-A-specific Abs could be detected in the serum of patients with measurable CD4 T cell responses specific for Melan-A/MART-1. Interestingly, even the short Melan-A/MART-126–35(A27L) peptide was recognized by CD4 T cells from HLA-DQ6+ and HLA-DR3+ melanoma patients. Using Melan-A/MART-125–36/DQ6 tetramers, we could detect Ag-specific CD4 T cells directly ex vivo in circulating lymphocytes of a melanoma patient. Together, these results provide the basis for monitoring of naturally occurring and vaccine-induced Melan-A/MART-1-specific CD4 T cell responses, allowing precise and ex vivo characterization of responding T cells. Melan-A/MART-1 (hereafter Melan-A) is a 118-aa long protein which is expressed in normal melanocytes and is found in 75–100% of primary and metastatic tumors of melanocytic origins (1). Melan-A was cloned as a gene encoding an immunodominant tumor Ag in 1994 by two different groups using tumor-reactive CTL clones and tumor cDNA libraries (2, 3) (3). The sequence recognized by the CTLs was found to be located in the region encompassing aa 26–35 of Melan-A and presented by HLA-A2. Subsequently, three additional epitopes restricted by HLA-A2, -B35, and -B45 were described (4, 5, 6). Melan-A-specific CD8 T cells with a naive phenotype are found ex vivo in the blood of healthy HLA-A2+ adults (7). In HLA-A2+ melanoma patients, Ag-experienced cells are found in peripheral blood and in tumor lesions and display the capacity to lyse Melan-A-expressing target cells (8). Based on its expression restricted to normal and transformed melanocytes and on the presence of Ag-specific CD8 T cells in melanoma patients, Melan-A has been used in different immunotherapy protocols. Together with other tumor Ags, vaccination studies have shown in many cases a transient expansion of specific CD8 T cells after treatment, but thus far an objective tumor response rate of only 3–10% of treated patients has been observed (9). Thus, a better understanding of antitumor responses and optimization of vaccination protocols is needed. Lessons from animal studies suggest the need for a concomitant activation of Ag-specific CD4 and CD8 T cells. CD4 T cells, so-called Th cells, are central orchestrators of immune responses by driving the differentiation of B cells to Ab-secreting plasma cells, activating and recruiting macrophages and eosinophils (10), and, importantly, by playing an essential role in the acquisition of full effector functions and maintenance of a long-lasting memory pool of CTLs (11, 12, 13). The bridge between CD4 and CD8 T cells during the induction of an immune response is thought to be made by dendritic cells, which process and present Ags to CD4 and CD8 T cells in secondary lymphoid organs (14, 15, 16). The description of Th epitopes is of great interest to both detect and study naturally occurring tumor-associated Ags (TAA)3-specific CD4 T cells in cancer patients, and include MHC class II-restricted Ags in vaccination trials. Over the past decade, much effort has been devoted in this direction. As a result, a relatively long list of MHC class II-restricted tumor Ags is now available online (〈www.cancerimmunity.org/peptidedatabase/Tcellepitopes.htm〉). The detection of Ag-specific T cells has been improved since 1996 by the introduction of peptide:MHC class I multimers, which allow for the detection of CD8 T cells irrespective of their functional properties (17). The development of similar reagents for the detection of Ag-specific CD4 T cells has proven more challenging. Nevertheless, studies have documented the use of tetramers to specifically detect CD4 T cells ex vivo or after in vitro expansion (18, 19). To date, only one Th epitope has been described for Melan-A (20). The sequence recognized by CD4 T cells is Melan-A51–73 and is restricted by HLA-DRB1*0401. In that study, DRB1*0401-binding sequences were predicted by algorithms and confirmed by in vitro-binding experiments. Peptides with good binding scores were then synthesized and used to expand and detect peptide-specific CD4 T cells in melanoma patients. A vaccination trial with this peptide has shown detectable and increased frequencies of specific CD4 T cells after treatment (21). To search for novel CD4 T cell targets of naturally acquired immunity to the Melan-A protein, we have used a pool of peptides spanning the entire protein to stimulate enriched CD4 T cell populations from PBMCs of melanoma patients irrespective of their MHC class II genotype. In this study, we report the successful identification of two novel MHC class II-restricted sequences in Melan-A, which are both located in the same region as the immunodominant HLA-A2-restricted CTL epitope Melan-A26–35. Using specific CD4 T cell clones, we could define the minimal epitopes recognized by those cells and show that they are naturally processed and presented by tumor cell lines in vitro. Moreover, Melan-A25–36/DQB1*0602 multimers allowed us to directly detect specific CD4 T cells in melanoma patient’s blood samples. Peripheral blood was obtained from melanoma patients (Lausanne University Hospital) upon informed consent. Melanoma cell lines and EBV-transformed B (EBV-B) cells were maintained in RPMI 1640 (Invitrogen Life Technologies) supplemented with 10% heat-inactivated FCS. Culture medium for lymphocytes was RPMI 1640 supplemented with 8% heat-inactivated pooled human serum and recombinant human IL-2 (Chiron). Every 18–20 days, cells were restimulated with allogeneic irradiated PBMCs, 1 μg/ml PHA (PHA Murex; Oxoid) and 100 U/ml recombinant human IL-2. EBV-B cells were transduced with retroviral vector containing supernatants of pMFG-sig-Melan-A-I-tNGFR, pMFG-sig-Mage-C2-I-tNGFR, or pMFG-sig-hppct-I-tNGFR transfected Phoenix-Ampho cells. NGFR+ cells were further enriched by MACS sorting as already described (22). HLA class II typing was performed on genomic DNA extracted from frozen PBLs isolated from patients’ blood samples. HLA-DRB1 and -DQB1 low resolution typing (two-digit) was performed by reverse PCR-sequence-specific oligonucleotide hybridization using Luminex technology (OneLambda; Ingen). High resolution typing (four-digit) for HLA-DRB1, -DPB1, and -DQB1 loci was achieved by PCR-sequence-specific primers using Genovision reagents (Milan Analytica). Peptides were synthesized by Dr. C. Servis (Institute of Biochemistry, University of Lausanne, Epalinges, Switzerland), by standard solid-phase chemistry on a multiple peptide synthesizer (Applied Biosystems) using F-moc for transient NH2-terminal protection and were analyzed by mass spectrometry. All peptides were >90% pure as indicated by analytic HPLC. Lyophilized peptides were diluted in PBS-20% DMSO at 10 mg/ml or aliquots of 1 mg/ml and stored at −20°C. CD4 T cells enriched using anti-CD4 microbeads and MiniMACS magnetic separation columns (Miltenyi Biotec) were stimulated with autologous irradiated CD4− cells in the presence of a pool of 20-mer overlapping peptides (2 μM each) spanning the entire Melan-A protein. After 2 wk of in vitro stimulation, cultures were tested for the presence of specific CD4 T cells with the same pool of peptides (2 μM each) in an IFN-γ cytospot assay performed as follows. Cells were stimulated for 6 h at 37°C in the presence or absence of peptides and 10 μg/ml brefeldin A (Sigma-Aldrich) was added after the first hour of incubation. After incubation and washing, cells were stained with anti-CD4 mAb (BD Biosciences), then fixed with 1% formaldehyde, 2% glucose, and 5 mM azide in PBS and then stained intracellularly with anti-IFN-γ mAb in the presence of 0.1% saponin (Sigma-Aldrich). Samples were analyzed by flow cytometry and data were analyzed using CellQuest software (BD Biosciences). The positive cultures were then tested with each 20-mer peptide separately (2 μM each) using the same protocol. CD4 T cells producing IFN-γ in the presence of the pool of peptides were cloned using IFN-γ secretion assay (Miltenyi Biotec) after 6 h of peptide stimulation by flow cytometry-based sorting using a FACSVantage SE (BD Biosciences). Sorted cells were cloned by limiting dilution and growing clones were screened for IFN-γ release in the presence or absence of indicated Melan-A peptides. For each assay, 5,000–20,000 T cells were used. For recognition of indicated target cells, equal numbers of cells were pulsed or not with indicated peptides, extensively washed and then added to the T cells. Where indicated, supernatants of anti-HLA-DR (D1.12), -DP (B7.12.1), or -DQ (BT3.4) were used to specifically block MHC class II recognition. The MHC class II processing and presentation pathway was also blocked where indicated by using 30 mM NH4Cl. IFN-γ release was assessed in the culture supernatant after 24 h of incubation at 37°C by ELISA (hu IFN-γ Cytoset kit; BioSource Europe) following the manufacturer’s instructions and using flat-bottom 96-well Nunc-Immuno plates (Apogent). The generation of HLA-DQB1*0602 multimers was performed as already described (23) using the Melan-A25–36 peptide. Multimer labeling was performed for 1 h at 37°C before staining with fluorescent mAbs directed against surface molecules (20 min at 4°C). Cells were then washed and analyzed by flow cytometry on a FACSCanto (BD Biosciences) using Cell Quest software (BD Biosciences). Polystyrene plates (NUNC Maxisorp; Apogent) were coated overnight at 4°C with recombinant proteins (5 μg/ml in PBS), peptides (20 μg/ml in PBS), or PBS alone. After washing with PBST (0.05% Tween 20 (Sigma-Aldrich) in PBS), plates were blocked for 1 h at room temperature (RT) with 5% milk in PBST. The supernatants were then discarded and diluted serum samples (1/100 in 2.5% milk, PBST) were added. After incubation at RT for 1 h, plates were washed and additionally incubated 1 h at RT with alkaline phosphatase-conjugated goat anti-human Ig polyvalent (1/100 in PBST; Sigma-Aldrich). Finally, plates were washed and a substrate for alkaline phosphatase (pNPP, Sigma-Aldrich) was added. The OD was read at 405 nm after a 30-min incubation. To obtain a global picture of Melan-A-specific CD4 T cell responses taking place in melanoma, we stimulated CD4 T cells from 16 randomly selected metastatic melanoma patients with a pool of 11 peptides covering the entire Melan-A protein. These peptides were 20-aa long and overlapped by 10 aa (Fig. 1⇓A). After one or two rounds of stimulation, a 6-h IFN-γ cytospot assay using the same pool of peptides was performed. CD4 T cells that secreted IFN-γ in response to the peptide pool were detected in 9 of the 16 patients tested (Table I⇓). Undetectable or very low frequency of IFN-γ-positive cells was found in controls without peptide. However, two exceptions occurred with LAU 321 and LAU 42, who showed nonnegligible fractions of CD4 T cells secreting IFN-γ in absence of peptide. The frequency of CD4 T cells producing IFN-γ in the responding patients ranged from 0.40 to 1.38% after the first stimulation and from 0.14 to 3.20% after the second stimulation, when the latter was performed (Fig. 1⇓B). In all patients with detectable Melan-A-specific CD4 T cells, the frequency increased after the second stimulation. In seven of nine responding cultures, the primary cultures were used to perform IFN-γ cytospot assay using the 11 peptides separately, to determine the region recognized by the CD4 T cells responding to the peptide pool (Table II⇓). These experiments could not be achieved with LAU 155 and LAU 465 because of the low number of cells recovered after in vitro peptide stimulation. However, independent experiments performed with cells from LAU 465 demonstrated that this patient had a CD4 T cell response against Melan-A51–73 presented by HLA-DRB1*0401. However, we cannot exclude that CD4 T cells responding to the peptide mix are directed against another region of Melan-A. 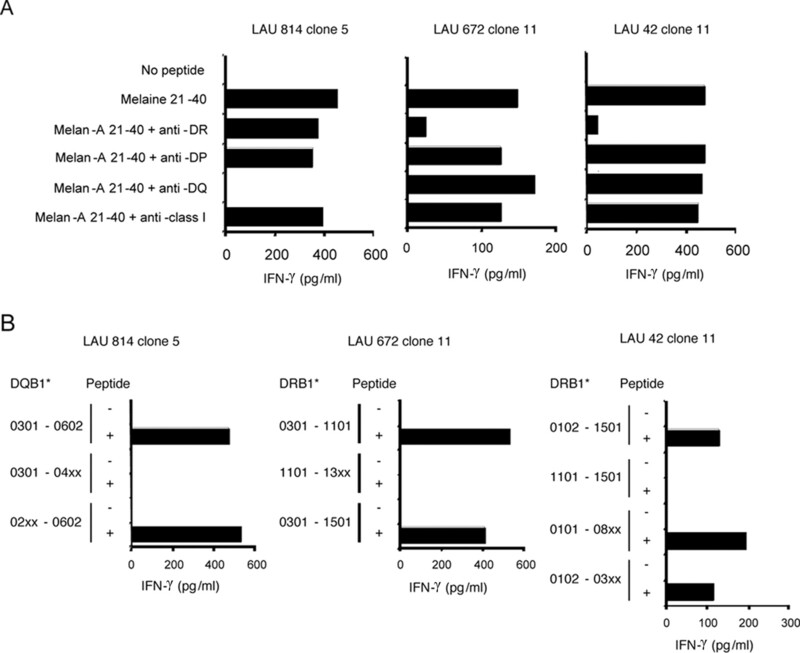 LAU 108 had CD4 T cells responding to the Melan-A51–70 peptide, which could correspond to the already described DR4-restricted Melan-A51–73 epitope (20). To confirm this, we used T2-DR4 cells pulsed either with Melan-A51–70 or Melan-A51–73 in the cytospot assay. Both peptides were recognized in an HLA-DR4-restricted manner (Fig. 1⇓C). The six other responding patients (LAU 618, LAU 42, LAU 321, LAU 672, LAU 4, and LAU 814) showed responses against three additional regions of Melan-A: Melan-A1–20, Melan-A21–40, and Melan-A41–60. These results showed that among 16 melanoma patients tested, >50% of them displayed Melan-A-specific CD4 T cell responses. In six of them, the response was directed to peptides corresponding to no described MHC class II-restricted epitopes and one was restricted to Melan-A51–70, which corresponds to the already described DRB1*0401-restricted Melan-A epitope. Assessment of Melan-A-specific CD4 T cell responses in circulating lymphocytes from melanoma patients. A, Amino acid sequences of the 11 overlapping peptides spanning the Melan-A protein used to stimulate CD4 T cells. B, CD4 T cells were stimulated with a pool containing the 11 peptides described in A; the presence of Melan-A-specific CD4 T cells was assessed after stimulation by intracellular staining with anti-IFN-γ mAb in the absence or presence of the same pool of peptides. Examples of responding patients are shown and the numbers in the upper right quadrants are the percentage of cytokine-producing cells among CD4 T cells. C, CD4 T cells from LAU 108 generated as described in B were mixed with T2-DR4 cells pulsed without or with the indicated peptide. The presence of specific cells was assessed after stimulation by intracellular staining with anti-IFN-γ mAb. The numbers in the upper right quadrants are the percentage of cytokine-producing cells among CD4 T cells. We then focused on the responses to the region Melan-A21–40, because this region contains the immunodominant HLA-A2-restricted epitope Melan-A26–35 and defining Th epitopes in the same region is of practical interest. We derived clones using the IFN-γ capture assay and flow cytometry-assisted cell sorting to select CD4 T cells from the primary cultures that were able to respond to short-term stimulation with Melan-A21–40. The growing clones were screened for Melan-A21–40 specificity by IFN-γ ELISA after 20 h of stimulation. We selected clones from patients LAU 618, LAU 672, LAU 814, and LAU 42 for additional experiments. First, we determined the HLA restriction of Melan-A21–40 peptide recognition using either anti-HLA-DR-, -DP-, or -DQ-specific Abs. 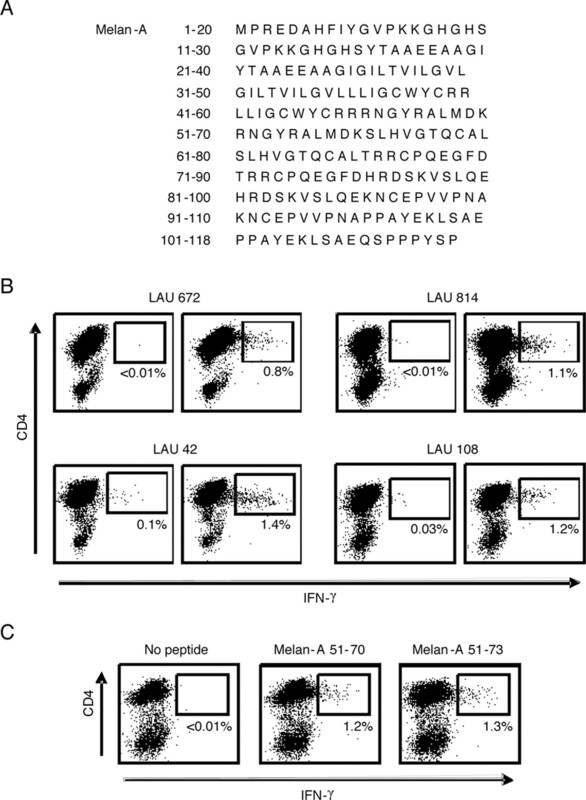 The Melan-A21–40-specific CD4 T cell clones from LAU 618 and LAU 814 recognized the peptide in an HLA-DQ-restricted manner. In the case of LAU 42 and LAU 672, a reduction of IFN-γ production was seen only with anti-HLA-DR Ab (Fig. 2⇓A and data not shown). Thus, in the case of LAU 42 and LAU 672, the CD4 T cell response specific for Melan-A 21–40 appeared to be HLA-DR restricted and in the case of LAU 618 and LAU 814 it appeared to be HLA-DQ restricted. To identify the restricting allele, we used a panel of EBV-B cells to present Melan-A21–40 peptide to the different clones. Using different combinations of presenting EBV-B cells, we could determine that the clones from LAU 618 and LAU 814 recognized the Melan-A21–40 peptide presented by HLA-DQB1*0602, the clones from LAU 672 recognized the peptide presented by HLA-DRB1*0301 and the clones from LAU 42 recognized the same peptide presented by HLA-DRB1*0101 and HLA-DRB1*0102 (Fig. 2⇓B and data not shown). In conclusion, these results allowed us to show that Melan-A21–40-specific CD4 T cell responses detected in three melanoma patients were restricted by four different alleles, namely HLA-DRB1*0101, -DRB1*0102, -DRB1*0301, and -DQB1*0602. Identification of the MHC class II-restricting elements and alleles. A, To determine the MHC class II-restricting element, peptide recognition was assessed either in the absence or in the presence of anti-HLA-DR or -DP, or -DQ or MHC class I Ab supernatants. B, The MHC class II-restricting allele was determined by assessing the ability of pulsed or unpulsed molecularly typed EBV-B cells to present Melan-A21–40 peptide to the indicated CD4 T cell clones. To more precisely define the epitopes recognized by the clones from the four patients, we synthesized a set of 11 peptides spanning amino acids 21–40 of Melan-A and containing stepwise deletions of 2 aa from the C or the N terminus. These were used to map the minimal epitopes recognized by the different clones. As shown in Fig. 3⇓A, clones from both LAU 672 and LAU 814 were able to recognize Melan-A21–36 and Melan-A25–40 at a level similar to that observed for recognition of Melan-A21–40. In some cases, clones from LAU 814 were able to recognize to a lower extent Melan-A27–40, but only at high peptide concentration as assessed by peptide titration experiments (Fig. 3⇓B). We also used Melan-A21–35 and Melan-A26–40 for peptide recognition experiments. Melan-A21–35 was recognized by very few clones at a level much lower than Melan-A21–36 and Melan-A26–40 was never recognized (data not shown). Clones from LAU 618 gave similar results as clones from LAU 814 (data not shown). When the minimal Melan-A25–36 peptide was included in peptide titration experiments, CD4 T cell clones recognized it with the same functional avidity as for the other peptides (Fig. 3⇓B). Altogether, those results indicate that Melan-A25–36 is the minimal HLA-DQB1*0602 and HLA-DRB1*0301-restricted epitope. In the case of LAU 42, clones were able to recognize the minimal peptide Melan-A27–40 (Fig. 3⇓). The further removal of two amino acids at either side of the peptide completely abolished recognition by all clones tested. Peptides Melan-A27–39 and Melan-A26–40 were also tested, but were not recognized (data not shown). Thus, the minimal epitope recognized in an HLA-DRB1*01-restricted manner is Melan-A27–40. Mapping of the minimal epitopes recognized by CD4 T cell clones. A, To determine the minimal sequences recognized by the CD4 T cells, peptide recognition was assessed in the presence of peptides shortened by 2 aa either at the N terminus or at the C terminus starting from the 20 aa recognized peptides. B, The minimal recognized sequences were used in peptide titration experiments. Next, we wanted to know whether the identified epitopes were naturally processed and presented by MHC class II-positive cells. Therefore, two types of cells were used as APCs. The first were EBV-B cells expressing Melan-A or a control gene. The others were melanoma cells expressing Melan-A and the matched MHC class II molecule or control ones as indicated in Fig. 4⇓. Clones derived from LAU 814 (Fig. 4⇓A) produced IFN-γ only when EBV-B cells were expressing Melan-A and melanoma cells were expressing the HLA-DQB1*0602. However, treatment of T618A with IFN-γ during 48 h that induced a detectable level of expression of HLA-DQ at the cell surface was necessary to trigger recognition by CD4 T cell clones. Similar results were obtained with clones derived from LAU 42 (Fig. 4⇓B) and LAU 672 (Fig. 4⇓C). Recognition was apparent only in presence of Melan-A+ EBV-B cells and matched MHC class II+ melanoma cells, but not in presence of control cells. Notably, in these cases, melanoma cells constitutively expressed HLA-DR at their cell surface and were recognized even without IFN-γ treatment. However, addition of IFN-γ during 48 h enhanced the expression of MHC class II molecules and was accompanied by an increased efficiency of recognition by CD4 T cell clones. In all cases, pretreatment of target cells with NH4Cl, which blocks the MHC class II pathway, significantly reduced the IFN-γ response by CD4 T cell clones. 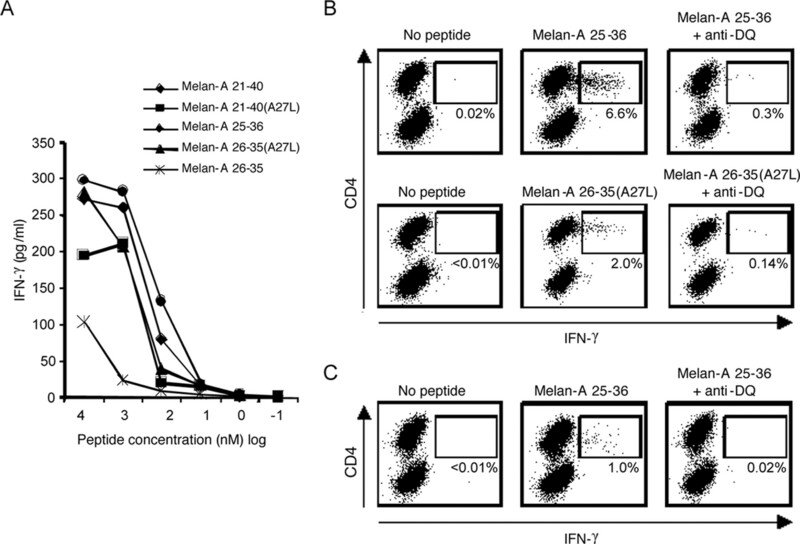 Together, these results showed that CD4 T cells specific for Melan-A27–40 and Melan-A25–36 were able to recognize Melan-A+ target cells indicating that these epitopes are naturally processed and presented. Recognition of naturally processed and presented epitopes. CD4 T cells were mixed with MHC class II-matched EBV-B cells expressing or not Melan-A and MHC class II-matched or not Melan-A-expressing tumor cells. Treatment of tumor cells with 50 U/ml IFN-γ for 48 h increased the MHC class II expression as shown by the MFI of MHC class II staining assessed by flow cytometry. In some cases, EBV-B and tumor cells were treated with NH4Cl to block the MHC class II pathway. CD4 T cell clones from (A) LAU 814, (B) LAU 42, and (C) LAU 672 are shown. The sequence of the minimal epitope from Melan-A that is presented by HLA-DQB1*0602 and HLA-DRB1*0301 (amino acids 25–36) largely encompasses the MHC class I-restricted epitope (aa 26–35). Therefore, we assessed the ability of clones from LAU 814 and LAU 618 to recognize the natural Melan-A26–35 peptide and the analog Melan-A26–35(A27L) peptide. Surprisingly, these clones were able to recognize Melan-A26–35(A27L) as efficiently as the Melan-A25–36 or Melan-A21–40 based on the functional avidity measured in peptide titration assays. Melan-A26–35 was less efficiently recognized (Fig. 5⇓A). Clones from LAU 672 which are also specific for Melan-A25–36, when presented by HLA-DRB1*0301, were also able to recognize Melan-A26–35(A27L) similarly to Melan-A25–36 (data not shown). To further substantiate this result, we stimulated in vitro CD4 T cells from LAU 618 (DQB1*0602+ patient) either with the peptide Melan-A21–40 or with the peptide analog Melan-A26–35(A27L). After 14 days, we performed IFN-γ cytospot assays to determine the frequencies of CD4 T cells responding to different peptides. The cells stimulated with Melan-A21–40 showed a strong response against Melan-A25–36 (6.6% of CD4 T cells), which could be blocked by the addition of anti-DQ Ab (Fig. 5⇓B). A lower number of cells also secreted IFN-γ in presence of Melan-A21–40, a response that was also restricted to HLA-DQB1*0602 (data not shown). Interestingly, when peptide Melan-A26–35(A27L) was added, 2% of CD4 T cells were able to secrete IFN-γ in an HLA-DQB1*0602-restricted manner. These results confirm the ability of CD4 T cells to recognize Melan-A26–35(A27L) presented by HLA-DQB1*0602. In the case where CD4 T cells were stimulated in vitro with Melan-A26–35(A27L), 0.98% of the resulting CD4 T cells were able to secrete IFN-γ in presence of Melan-A25–36. This response was also restricted by HLA-DQB1*0602 (Fig. 5⇓C). In summary, Melan-A26–35(A27L), which has been described as an MHC class I-restricted epitope, is able to expand and activate specific CD4 T cells when presented by HLA-DQB1*0602. 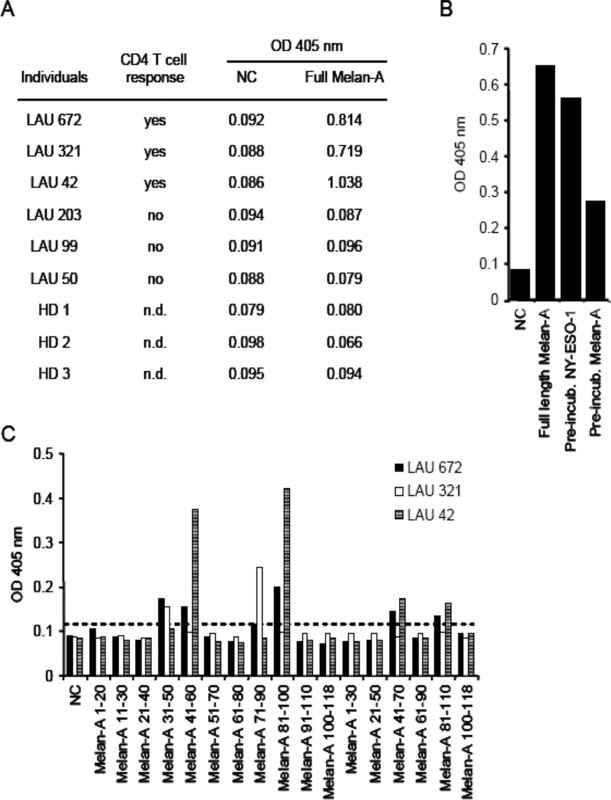 Recognition of Melan-A26–35(A27L) by CD4 T cell clones from LAU 814. A, Peptide titration experiments were performed using the native or A27L analog sequences of the long and minimal peptides recognized in a DQB1*0602-restricted manner. B, Enriched CD4 T cells were stimulated in vitro with Melan-A25–36 peptide for 14 days and the presence of Melan-A25–36- (upper panels) and Melan-A26–35(A27L)-specific (lower panels) cells was assessed by intracellular IFN-γ staining after stimulation without or with the specific peptide. Anti-HLA-DQ supernatant was used to block the recognition. C, Enriched CD4 T cells were stimulated with Melan-A26–35(A27L) for 14 days and the presence of Melan-A25–36-specific cells was assessed as described in B. Several studies have shown the presence of TAA-specific Abs in cancer patients. Therefore, we searched for Melan-A-specific Abs in the serum of melanoma patients analyzed for CD4 T cell responses, as well as in healthy individuals. Using an ELISA, we were able to detect Abs reacting against the rMelan-A protein in three patients who displayed specific CD4 T cell responses. In contrast, in three patients with no CD4 T cell responses, as well as in three healthy individuals, no Abs were detected (Fig. 6⇓A). To confirm the specificity of Ab responses, we preincubated the serum of seropositive patients with either recombinant Melan-A or NY-ESO-1 proteins prior addition to Melan-A-coated plates. The ELISA signals obtained with sera preincubated with the Melan-A protein were reduced compared with those obtained with untreated sera or sera preincubated with the control protein (Fig. 6⇓B). This indicated the specificity of the ELISA signals. We then tried to map the region(s) of Melan-A recognized by the Abs. ELISA were therefore performed with plates coated with overlapping Melan-A peptides (20 or 30 mer). No reactivity was detected against any of the Melan-A peptides using sera from healthy individuals or melanoma patients with no Abs against the full-length protein. In contrast, when seropositive patients were analyzed, reactivity was detected against the following peptides: Melan-A31–50, Melan-A41–60, Melan-A71–90, Melan-A81–100, Melan-A41–70, and Melan-A81–110 (Fig. 6⇓C and data not shown). It has to be noted that the pattern of peptides recognized was not identical in all seropositive patients. Interestingly, Abs against rMelan-A protein raised in mice (clones A103 (24) and M27C10 (25)) or rabbit (25) detect epitopes contained in the last C-terminal 20 aa (26). Altogether, these experiments showed that anti-Melan-A-specific Abs can be detected in melanoma patients, and that the presence of such Abs is linked to the presence of Melan-A-specific CD4 T cell responses. Detection of anti-Melan-A Abs. A, The presence of Abs against Melan-A in the serum of indicated individuals was assessed using rMelan-A protein. B, Specificity of the signals obtained in A was assessed by preincubation of patients’ sera with rMelan-A or irrelevant protein before detecting the specific Abs as in A. A representative result is shown with LAU 672. C, The mapping of the regions recognized by the anti-Melan-A Abs was performed using the indicated synthetic peptides. The Melan-A25–36 peptide was used to prepare HLA-DQB1*0602 tetramers which were tested on clones generated from LAU 814 and additional nonspecific clones as negative controls. Several independent CD4 T cell clones specific for Melan-A25–36 were stained by the tetramers and no staining was observed on irrelevant clones (Fig. 7⇓A, and additional CD4 T cell clones of unrelated specificity, data not shown). We next analyzed ex vivo PBL from a DQB1*0602+ melanoma patient (LAU 618) in which we detected specific cells after in vitro peptide stimulation. We used anti-CD14 and -CD19 mAbs to exclude B cells and monocytes from the analysis, because MHC class II tetramers have a tendency to bind nonspecifically to such cells. However, remaining background multimer staining could be observed on CD4− cells. Additional experiments demonstrated that these multimer-positive events were on CD3−CD19+ or CD3−CD14+ (data not shown), which proves nonspecific background staining. In addition, we excluded dead cells using propidium iodide (PI) because PI+ cells are often stained nonspecifically by the tetramers. We could detect ex vivo CD4 T cells that were stained with Melan-A25–36 tetramers. These represented 0.06% of the total CD4 T cells (Fig. 7⇓B, left panel). Some nonspecific background was observed on CD4− cells. In addition, we costained in the same sample with anti-CD8 mAb and Melan-A26–35(A27L)/A2 multimers to simultaneously detect Melan-A-specific CD8 T cells. This population represented 1.36% of the CD8 T cells in that sample (Fig. 7⇓B, central panel). These data provide additional evidence that melanoma patients have CD4 T cells that recognize Melan-A25–36 in a HLA-DQB1*0602-restricted manner. Finally, combining the tetramer staining with phenotypic marker analysis, we found that all Melan-A25–36/DQB1*0602 tetramer-positive cells had a memory phenotype as they were all CD45RAlow. Among these cells, one-third were CCR7+ and the remaining were CCR7−, but all of them displayed a CD28+ phenotype. Moreover, one-third of the tetramer+ cells were HLA-DR+, but none of them were CD38+. Together, these data indicate that the Melan-A25–36-specific CD4 T cells are Ag-experienced cells, but have not been recently activated. Detection of Melan-A25–36-specific CD4 T cells with Melan-A25–36/DQB1*0602 tetramers. A, Specific clones from LAU 814 and irrelevant ones were stained with Melan-A25–36/DQB1*0602 tetramers and anti-CD4 mAb. PI was used to exclude dead cells. Examples of staining are shown and plots are gated on PI− lymphocytes. B, Ex vivo PBL sample from LAU 618 was stained with Melan-A25–36/DQB1*0602, Melan-A26–35(A27L)/A*0201 tetramers, anti-CD4 mAb and anti-CD8 mAb. Nonspecific tetramer staining was excluded using anti-CD14 and anti-CD19 mAbs and dead cells were excluded using PI. Plots are gated on total PI− lymphocytes. C, The phenotype of CD4+ tetramer+ T cells was assessed using the indicated mAbs. Plots are gated on CD4+CD19−CD14−PI− lymphocytes. To our knowledge, this is the first systematic study of the human CD4 T cell response to the well-defined melanocyte/melanoma differentiation Ag Melan-A. We used a pool of 11 20-aa long peptides covering the entire Melan-A polypeptide sequence to reveal the extent of Melan-A-specific CD4 T cell responses in a group of 16 patients with advanced metastatic melanoma. Among them, at least two patients expressed one of the most frequently found HLA-DRB1, -DPB1, and -DQB1 alleles in Caucasians. We could readily detect peptide pool reactivity in nine patients thus indicating that over half of patients do mount such T cell responses during the course of their disease. Previous studies on the CD8 T cell response to the HLA-A2-restricted Melan-A26/27–35 peptide have clearly established that a comparable proportion of patients acquire memory T cell responses against that epitope that can be readily revealed by A2/Melan-A26–35 tetramer labeling of tumor-infiltrating lymphocytes (8, 27, 28, 29). We could define different regions of the Melan-A polypeptide as targets of the Melan-A-specific CD4 T cells. Interestingly, all of the target sequences were confined to the residues 1–70, that is the N-terminal half of the polypeptide. This is in marked contrast with the narrow focus of CD8 T cells on the region spanning Melan-A residues 25–36 (3, 5, 6, 30). It is noteworthy that the in vitro peptide stimulation strategy used here led to the identification of three epitopes in the region Melan-A21–40 that are naturally processed and presented by Melan-A-expressing target cells. Among the two other regions of Melan-A that we found as target of CD4 T cells, one (Melan-A1–20) has been very recently shown to be naturally processed and presented by HLA-DRB1*1101 and *1104 (31). Concerning the other one (Melan-A41–60), its natural processing and presentation to CD4 T cells remains to be assessed. The experimental approach consisting in stimulating in vitro CD4 T cells with synthetic peptides used to identify new Ag-derived epitopes may indeed lead to the description of epitopes nonnaturally generated. Nevertheless, the results we show here, together with the results obtained by Zarour et al. (20) and by Godefroy et al. (31) clearly establish the occurrence of multiple Melan-A-derived epitopes that are naturally processed and presented. The direct presentation of these epitopes by Melan-A-expressing tumor cells may be explained by recent observations indicating that ubiquitin-mediated sorting to endosomal vesicles followed by degradation in lysosomal compartments contributes to the rapid turnover of the protein (32). Thus, it is conceivable that the Melan-A polypeptide is efficiently degraded into peptides that may be readily available for loading onto MHC class II molecules. We also searched for IgG Abs directed against Melan-A. Although such Abs were not detectable in healthy individuals or melanoma patients with no detectable Melan-A-specific CD4 T cell responses, they were present in all the CD4 T cell responders tested. This finding stands in contrast to the negative results of a previous study that used a similar recombinant Melan-A protein to screen ∼100 serum samples from melanoma patients (33). Although we cannot provide an explanation for this discrepancy, the correlation of Melan-A seropositivity in melanoma patients with the presence of Melan-A-specific CD4 T cell responses in this study recapitulates previous observations of NY-ESO-1 immunogenicity in patients with metastatic melanoma (34). Mapping of the anti-Melan-A Ab epitopes using 20- and 30-aa long peptides suggested that the target sequences are located in the C-terminal half of the protein. The bulk CD4 T cells from patient LAU 108 expanded by stimulation with the Melan-A peptide pool showed reactivity against Melan-A51–70. Because this patient is DR4 positive and the only MHC class II-restricted Melan-A epitope described to date (Melan-A51–73) is restricted by HLA-DRB1*0401 (20), we hypothesized that at least part of the reactive CD4 T cells were directed against the same HLA-DRB1*0401-restricted peptide. By using HLA-DRB1*0401-expressing target cells, we found that both peptides, Melan-A51–70 and Melan-A51–73, could stimulate CD4 T cells to produce IFN-γ, confirming our hypothesis. In fact, comparison of the proportions of bulk CD4 T cells producing IFN-γ in response to stimulation with these two peptides to those elicited by the total 11 peptide pool suggests that the entire response is directed against the HLA-DRB1*0401-restricted epitope. Our findings also indicate that the originally described peptide could be truncated by 3 aa at the C terminus without any negative effect on the efficiency of T cell recognition. A possible explanation might be that in the experiments performed by Zarour et al. (20), they used peptides predicted in silico to bind to HLA-DRB1*0401 to which they added several amino acid residues at each end of the peptides for in vitro experiments. The multiplicity of Melan-A peptides recognized by specific CD4 T cells after only one or two rounds of in vitro stimulation with the Melan-A peptide pool encouraged us to carefully delineate the epitope(s) being recognized. We concentrated on the region represented by peptide Melan-A21–40 not only because it contains the immunodominant CD8 T cell epitope(s) but also because five of the seven patients studied at the single peptide level focused on this region. More than 100 CD4 T cell clones were isolated from four of these patients. Such clones allowed the identification of two new Th epitopes which can be presented to CD4 T cells by at least two MHC class II molecules each. The first one is Melan-A27–40 (AAGIGILTVILGVL). It is restricted by HLA-DRB1*0101 and -DRB1*0102, alleles that are found in 10–18% of Caucasians. A comparison of the Melan-A27–40 sequence with the known DRB1*0101-binding motifs (35, 36) showed that this peptide fits with the following required anchor residues. Indeed, the amino acids predominantly involved in binding to DR1 are those at positions P1, P4, and P6. P1 is the crucial anchor residue that binds in the deepest hydrophobic pocket of DR1 molecule and usually has a large aromatic or hydrophobic side chain. At position P6, a small noncharged residue is normally found and at position P4, there should be no D, E, or F.
The second epitope in the same Melan-A21–40 region is best defined by the peptide Melan-A25–36 (EEAAGIGILTVI). CD4 T cell recognition of this peptide is restricted by two MHC class II molecules encoded by alleles DQB1*0602 and DRB1*0301. These are expressed by 20–25% and 15–20% of Caucasians, respectively. Again, comparing this sequence with the HLA-DQB1*0602- and HLA-DRB1*0301-specific peptide binding motifs, it is predicted to bind well to HLA-DQB1*0602, but not to HLA-DRB1*0301. Indeed, the residues at positions P1, 3, 4, 6, and 9 were found to be important for binding to HLA-DQB1*0602 and the Melan-A25–36 sequence would fit with the permissive amino acid residues in that motif (37). In contrast, this sequence does not contain any of the amino acids described as important for HLA-DRB1*0301 binding. Indeed, none of the residues at positions P1, P4, and/or P3 fit with any of the three known binding motifs (38, 39). However, this would not necessarily mean that the peptide fails to bind to HLA-DRB1*0301, as some good binders in that study did not carry the binding motif. Indeed, independently of the presence or absence of a consensus-binding motif, the two optimal-length peptides were efficiently recognized by Melan-A-specific CD4 T cells when pulsed on EBV-B cells. In addition, these peptides were also shown to be immunogenic as they were able to expand specific CD4 T cells strongly suggesting that they can bind to the particular presenting MHC class II molecules such as to ensure both antigenicity and immunogenicity. The most surprising finding in the present study is the fact that the peptide analog Melan-A26–35(A27L), which mimics the immunodominant Melan-A epitope recognized by HLA-A2-restricted CD8 T cells (40), is efficiently recognized by CD4 T cells in a HLA-DQB1*0602- and HLA-DRB1*0301-restricted manner. Interestingly, the A27L substitution appears to be important for CD4 T cell clone recognition. Indeed, the efficiency of recognition of the nonsubstituted Melan-A26–35 is at least one order of magnitude lower than that of the optimal Melan-A25–36 wild-type peptide. Moreover, the Melan-A26–35(A27L) peptide analog could stimulate the expansion of CD4 T cells from HLA-DQB1*0602+ melanoma patients. The expanded cells were in turn able to recognize the minimal epitope spanning the Melan-A25–36 sequence in an HLA-DQB1*0602-restricted manner. This finding raises the possibility that vaccination with the Melan-A26–35(A27L) peptide analog in HLA-A*0201+, HLA-DQB1*0602+ melanoma patients may elicit not only an HLA-A*0201-restricted CD8 T cell response but also an HLA-DQB1*0602-restricted CD4 T cell response. Because indeed this Melan-A peptide analog has been widely used for peptide vaccination of melanoma patients this is an important issue to explore. As a first step toward a more complete monitoring of Melan-A-specific CD4 T cell responses, we loaded Melan-A25–36 peptide on DQB1*0602 tetramers and could successfully show specific labeling of CD4 T cell clones producing IFN-γ in a short-term stimulation assay with Melan-A25–36 and HLA-DQB1*0602-expressing APCs. Using these reagents we could also directly detect ex vivo Melan-A-specific CD4 T cells on PBL from a metastatic melanoma patient vaccinated with the Melan-A26–35(A27L) peptide. The Melan-A25–36/DQB1*0602 tetramer+ CD4 T cells all had a memory phenotype, one-third were central memory and the remaining were effector memory. Furthermore, all were CD28+ thus resembling T cells with the capacity to produce cytokines and express helper molecules but perforin− and thus unable to directly kill target cells (41). The frequency of Melan-A-specific CD4 T cells reported here are much higher than frequencies already reported for TAA-specific CD4 T cells in nonvaccinated individuals. Therefore, it is tempting to speculate that the Ag-experienced Melan-A25–36/DQB1*0602 tetramer+ CD4 T cells we detected have been expanded in response to Melan-A26–35(A27L) vaccination. Indeed, this patient has received a total of 18 peptide injections over a period of ∼30 mo. As already reported, this concomitantly elicited an impressive HLA-A2/Melan-A-specific CD8 T cell response in the same patient (42). The fact that one-third of the tetramer+ CD4 T cells we detected was HLA-DR+, but CD38−, might reflect their activation by the last vaccine boost given 14 days before the blood sampling. Moreover, no Melan-A25–36/DQB1*0602 tetramer+ CD4 T cells could be detected in a sample taken before any peptide vaccination (data not shown). Additional experiments are planned to study in more details the effect of Melan-A26–35(A27L) vaccination on CD4 T cells. In conclusion, the identification of new Melan-A-derived Th epitopes and availability of the corresponding MHC class II multimers provide new opportunities for monitoring the global Melan-A-specific CD4 T cell response in melanoma patients in different clinical settings including natural disease course and vaccination. In particular, future studies including a large number of melanoma patients should provide insights on the existence of coordinated humoral and cell-mediated immunity to Melan-A derived Ags. Importantly, our findings also suggest novel candidates for vaccine development. Indeed, different strategies have been developed to elicit both CD4 and CD8 T cell responses. Injection of separate MHC I- and MHC II-restricted peptides has been tested in mice and in humans (43). In addition, engineered peptide constructs have been developed and tested in mouse models, using MHC I- and MHC II-restricted peptide sequences linked to a Tat sequence allowing a better delivery of the construct in APCs (44). However, Th epitopes we describe here contain either most (Melan-A27–40) or the whole (Melan-A25–36) immunodominant, HLA-A2-restricted, Melan-A26–35 epitope. This means that immunization with a relatively long peptide representing a nonmodified sequence such as Melan-A21–40 would target both MHC class I- and class II-restricted CD8 and CD4 T cell responses. Although additional work will be needed to optimize such peptides, this approach has already proven to be effective in inducing broad, as well as long-lasting specific T cell responses that may be protective against tumor development (45, 46, 47). Such a vaccination strategy might be suitable for a large proportion of melanoma patients that would include HLA-A*0201, -B*3502, -B*4501, and HLA-DRB1*0101 and *0102, -DRB1*0301, and DQB1*0602 according to the data published so far and the results described in the present study (66% of Caucasians expressing one of these MHC class I alleles and 54% of them expressing one of these MHC class II alleles). Needless to emphasize it, monitoring of vaccination with this peptide would involve well-characterized reagents for flow cytometry-based phenotyping as well as for functional assays. We thank the patients for study participation and blood donation, and the hospital staff at the Centre Pluridisciplinaire d’Oncologie for excellent collaboration. We gratefully acknowledge C. Servis (Department of Biochemistry, University of Lausanne) for peptides synthesis, G. Ritter (Ludwig Institute for Cancer Research (LICR), New York Branch) for production of recombinant Melan-A and NY-ESO-1 proteins, and E. Devevre (LICR, Lausanne Branch) for flow cytometry-based cell sorting. ↵1 This work was supported in part by the National Center for Competence in Research Molecular Oncology. G.B. was funded in part by the Muschamp Foundation. C.J. was supported by Fond National Suisse Oncosuisse. ↵3 Abbreviations used in this paper: TAA, tumor-associated Ag; EBV-B, EBV-transformed B; RT, room temperature; PI, propidium iodide. Hofbauer, G. F., J. Kamarashev, R. Geertsen, R. Boni, R. Dummer. 1998. Melan A/MART-1 immunoreactivity in formalin-fixed paraffin-embedded primary and metastatic melanoma: frequency and distribution. Melanoma Res. 8: 337-343. Coulie, P. G., V. Brichard, A. Van Pel, T. Wolfel, J. Schneider, C. Traversari, S. Mattei, E. De Plaen, C. Lurquin, J. P. Szikora, et al 1994. A new gene coding for a differentiation antigen recognized by autologous cytolytic T lymphocytes on HLA-A2 melanomas. J. Exp. Med. 180: 35-42. Kawakami, Y., S. Eliyahu, K. Sakaguchi, P. F. Robbins, L. Rivoltini, J. R. Yannelli, E. Appella, S. A. Rosenberg. 1994. Identification of the immunodominant peptides of the MART-1 human melanoma antigen recognized by the majority of HLA-A2-restricted tumor infiltrating lymphocytes. J. Exp. Med. 180: 347-352. Castelli, C., W. J. Storkus, M. J. Maeurer, D. M. Martin, E. C. Huang, B. N. Pramanik, T. L. Nagabhushan, G. Parmiani, M. T. Lotze. 1995. Mass spectrometric identification of a naturally processed melanoma peptide recognized by CD8+ cytotoxic T lymphocytes. J. Exp. Med. 181: 363-368. Benlalam, H., B. Linard, Y. Guilloux, A. Moreau-Aubry, L. Derre, E. Diez, B. Dreno, F. Jotereau, N. Labarriere. 2003. Identification of five new HLA-B*3501-restricted epitopes derived from common melanoma-associated antigens, spontaneously recognized by tumor-infiltrating lymphocytes. J. Immunol. 171: 6283-6289. Schneider, J., V. Brichard, T. Boon, K. H. Meyer zum Buschenfelde, T. Wolfel. 1998. Overlapping peptides of melanocyte differentiation antigen Melan-A/MART-1 recognized by autologous cytolytic T lymphocytes in association with HLA-B45.1 and HLA-A2.1. Int. J. Cancer 75: 451-458. Hung, K., R. Hayashi, A. Lafond-Walker, C. Lowenstein, D. Pardoll, H. Levitsky. 1998. The central role of CD4+ T cells in the antitumor immune response. J. Exp. Med. 188: 2357-2368. Rocha, B., C. Tanchot. 2004. Towards a cellular definition of CD8+ T-cell memory: the role of CD4+ T-cell help in CD8+ T-cell responses. Curr. Opin. Immunol. 16: 259-263. Marzo, A. L., B. F. Kinnear, R. A. Lake, J. J. Frelinger, E. J. Collins, B. W. Robinson, B. Scott. 2000. Tumor-specific CD4+ T cells have a major “post-licensing” role in CTL mediated anti-tumor immunity. J. Immunol. 165: 6047-6055. Ridge, J. P., F. Di Rosa, P. Matzinger. 1998. A conditioned dendritic cell can be a temporal bridge between a CD4+ T-helper and a T-killer cell. Nature 393: 474-478. Schoenberger, S. P., R. E. Toes, E. I. van der Voort, R. Offringa, C. J. Melief. 1998. T-cell help for cytotoxic T lymphocytes is mediated by CD40-CD40L interactions. Nature 393: 480-483. Bennett, S. R., F. R. Carbone, F. Karamalis, R. A. Flavell, J. F. Miller, W. R. Heath. 1998. Help for cytotoxic-T-cell responses is mediated by CD40 signalling. Nature 393: 478-480. Altman, J. D., P. A. Moss, P. J. Goulder, D. H. Barouch, M. G. McHeyzer-Williams, J. I. Bell, A. J. McMichael, M. M. Davis. 1996. Phenotypic analysis of antigen-specific T lymphocytes. Science 274: 94-96. Mallone, R., G. T. Nepom. 2004. MHC class II tetramers and the pursuit of antigen-specific T cells: define, deviate, delete. Clin. Immunol. 110: 232-242. Buckner, J. H., U. Holzer, E. J. Novak, H. Reijonen, W. W. Kwok, G. T. Nepom. 2002. Defining antigen-specific responses with human MHC class II tetramers. J. Allergy Clin. Immunol. 110: 199-208. Zarour, H. M., J. M. Kirkwood, L. S. Kierstead, W. Herr, V. Brusic, C. L. Slingluff, Jr, J. Sidney, A. Sette, W. J. Storkus. 2000. Melan-A/MART-1(51–73) represents an immunogenic HLA-DR4-restricted epitope recognized by melanoma-reactive CD4+ T cells. Proc. Natl. Acad. Sci. USA 97: 400-405. Wong, R., R. Lau, J. Chang, T. Kuus-Reichel, V. Brichard, C. Bruck, J. Weber. 2004. Immune responses to a class II helper peptide epitope in patients with stage III/IV resected melanoma. Clin. Cancer Res. 10: 5004-5013. Breckpot, K., M. Dullaers, A. Bonehill, S. van Meirvenne, C. Heirman, C. de Greef, P. van der Bruggen, K. Thielemans. 2003. Lentivirally transduced dendritic cells as a tool for cancer immunotherapy. J. Gene Med. 5: 654-667. Kwok, W. W., A. W. Liu, E. J. Novak, J. A. Gebe, R. A. Ettinger, G. T. Nepom, S. N. Reymond, D. M. Koelle. 2000. HLA-DQ tetramers identify epitope-specific T cells in peripheral blood of herpes simplex virus type 2-infected individuals: direct detection of immunodominant antigen-responsive cells. J. Immunol. 164: 4244-4249. Chen, Y. T., E. Stockert, A. Jungbluth, S. Tsang, K. A. Coplan, M. J. Scanlan, L. J. Old. 1996. Serological analysis of Melan-A(MART-1), a melanocyte-specific protein homogeneously expressed in human melanomas. Proc. Natl. Acad. Sci. USA 93: 5915-5919. Kawakami, Y., J. K. Battles, T. Kobayashi, W. Ennis, X. Wang, J. P. Tupesis, F. M. Marincola, P. F. Robbins, V. J. Hearing, M. A. Gonda, S. A. Rosenberg. 1997. Production of recombinant MART-1 proteins and specific antiMART-1 polyclonal and monoclonal antibodies: use in the characterization of the human melanoma antigen MART-1. J. Immunol. Methods 202: 13-25. De Maziere, A. M., K. Muehlethaler, E. van Donselaar, S. Salvi, J. Davoust, J. C. Cerottini, F. Levy, J. W. Slot, D. Rimoldi. 2002. The melanocytic protein Melan-A/MART-1 has a subcellular localization distinct from typical melanosomal proteins. Traffic 3: 678-693. Seiter, S., V. Monsurro, M. B. Nielsen, E. Wang, M. Provenzano, J. R. Wunderlich, S. A. Rosenberg, F. M. Marincola. 2002. Frequency of MART-1/MelanA and gp100/PMel17-specific T cells in tumor metastases and cultured tumor-infiltrating lymphocytes. J. Immunother. 25: 252-263. Zippelius, A., P. Batard, V. Rubio-Godoy, G. Bioley, D. Lienard, F. Lejeune, D. Rimoldi, P. Guillaume, N. Meidenbauer, A. Mackensen, et al 2004. Effector function of human tumor-specific CD8 T cells in melanoma lesions: a state of local functional tolerance. Cancer Res. 64: 2865-2873. Romero, P., N. Gervois, J. Schneider, P. Escobar, D. Valmori, C. Pannetier, A. Steinle, T. Wolfel, D. Lienard, V. Brichard, et al 1997. Cytolytic T lymphocyte recognition of the immunodominant HLA-A*0201-restricted Melan-A/MART-1 antigenic peptide in melanoma. J. Immunol. 159: 2366-2374. Godefroy, E., L. Scotto, N. E. Souleimanian, G. Ritter, L. J. Old, F. Jotereau, D. Valmori, M. Ayyoub. 2006. Identification of two Melan-A CD4+ T cell epitopes presented by frequently expressed MHC class II alleles. Clin. Immunol. 121: 54-62. Levy, F., K. Muehlethaler, S. Salvi, A. L. Peitrequin, C. K. Lindholm, J. C. Cerottini, D. Rimoldi. 2005. Ubiquitylation of a melanosomal protein by HECT-E3 ligases serves as sorting signal for lysosomal degradation. Mol. Biol. Cell 16: 1777-1787. Stockert, E., E. Jager, Y. T. Chen, M. J. Scanlan, I. Gout, J. Karbach, M. Arand, A. Knuth, L. J. Old. 1998. A survey of the humoral immune response of cancer patients to a panel of human tumor antigens. J. Exp. Med. 187: 1349-1354. Gnjatic, S., D. Atanackovic, E. Jager, M. Matsuo, A. Selvakumar, N. K. Altorki, R. G. Maki, B. Dupont, G. Ritter, Y. T. Chen, et al 2003. Survey of naturally occurring CD4+ T cell responses against NY-ESO-1 in cancer patients: correlation with antibody responses. Proc. Natl. Acad. Sci. USA 100: 8862-8867. Borras-Cuesta, F., J. Golvano, M. Garcia-Granero, P. Sarobe, J. Riezu-Boj, E. Huarte, J. Lasarte. 2000. Specific and general HLA-DR binding motifs: comparison of algorithms. Hum. Immunol. 61: 266-278. Southwood, S., J. Sidney, A. Kondo, M. F. del Guercio, E. Appella, S. Hoffman, R. T. Kubo, R. W. Chesnut, H. M. Grey, A. Sette. 1998. Several common HLA-DR types share largely overlapping peptide binding repertoires. J. Immunol. 160: 3363-3373. Ettinger, R. A., W. W. Kwok. 1998. A peptide binding motif for HLA-DQA1*0102/DQB1*0602, the class II MHC molecule associated with dominant protection in insulin-dependent diabetes mellitus. J. Immunol. 160: 2365-2373. Geluk, A., K. E. van Meijgaarden, S. Southwood, C. Oseroff, J. W. Drijfhout, R. R. de Vries, T. H. Ottenhoff, A. Sette. 1994. HLA-DR3 molecules can bind peptides carrying two alternative specific submotifs. J. Immunol. 152: 5742-5748. Chicz, R. M., R. G. Urban, J. C. Gorga, D. A. Vignali, W. S. Lane, J. L. Strominger. 1993. Specificity and promiscuity among naturally processed peptides bound to HLA-DR alleles. J. Exp. Med. 178: 27-47. Appay, V., J. J. Zaunders, L. Papagno, J. Sutton, A. Jaramillo, A. Waters, P. Easterbrook, P. Grey, D. Smith, A. J. McMichael, et al 2002. Characterization of CD4+ CTLs ex vivo. J. Immunol. 168: 5954-5958. Speiser, D. E., D. Lienard, N. Rufer, V. Rubio-Godoy, D. Rimoldi, F. Lejeune, A. M. Krieg, J. C. Cerottini, P. Romero. 2005. Rapid and strong human CD8+ T cell responses to vaccination with peptide, IFA, and CpG oligodeoxynucleotide 7909. J. Clin. Invest. 115: 739-746. Phan, G. Q., C. E. Touloukian, J. C. Yang, N. P. Restifo, R. M. Sherry, P. Hwu, S. L. Topalian, D. J. Schwartzentruber, C. A. Seipp, L. J. Freezer, et al 2003. Immunization of patients with metastatic melanoma using both class I- and class II-restricted peptides from melanoma-associated antigens. J. Immunother. 26: 349-356. Lu, J., Y. Higashimoto, E. Appella, E. Celis. 2004. Multiepitope Trojan antigen peptide vaccines for the induction of antitumor CTL and Th immune responses. J. Immunol. 172: 4575-4582. Zeng, G., Y. Li, M. El-Gamil, J. Sidney, A. Sette, R. F. Wang, S. A. Rosenberg, P. F. Robbins. 2002. Generation of NY-ESO-1-specific CD4+ and CD8+ T cells by a single peptide with dual MHC class I and class II specificities: a new strategy for vaccine design. Cancer Res. 62: 3630-3635. Lopez, J. A., C. Weilenman, R. Audran, M. A. Roggero, A. Bonelo, J. M. Tiercy, F. Spertini, G. Corradin. 2001. A synthetic malaria vaccine elicits a potent CD8+ and CD4+ T lymphocyte immune response in humans: implications for vaccination strategies. Eur. J. Immunol. 31: 1989-1998. Zwaveling, S., S. C. Ferreira Mota, J. Nouta, M. Johnson, G. B. Lipford, R. Offringa, S. H. van der Burg, C. J. Melief. 2002. Established human papillomavirus type 16-expressing tumors are effectively eradicated following vaccination with long peptides. J. Immunol. 169: 350-358.